Advant-Edge Decorative Curbing & Landscaping, Inc. has been known in the state of Arizona for outstanding landscape installation services. We always work hard to give clients the kind of landscape that they've been dreaming of. We are professional and highly experienced in various aspects of landscaping. From simple lawn installation to comprehensive landscaping projects, we have the capabilities and resources to complete them on time and according to our clients’ specifications. At Advant-Edge Decorative Curbing & Landscaping, Inc., we offer our clients with a wide range of options by creating different landscaping packages. We have a plan that can suit the needs and requirements of residential clients. We also have packages for large outdoor areas and commercial properties. If you want to learn more about these packages, please browse our landscaping page. 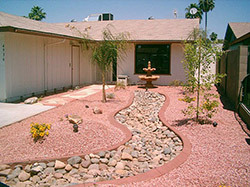 Our options include pricing for traditional landscape installation and desert landscaping projects. For those clients with distinct requirements, we offer them our customized packages. They can set the number of plantings, choose the kind of irrigation that we will install, specify the features to add, and other landscape options. And the best thing about us is that we can work on any budget range. When you hire us, you'll not worry about being charged beyond your set budget. When we started offering our landscape installation services, we ensure that we have the finest landscaping materials and supplies that we could use for our projects. We know that clients want attractive, functional and long-lasting landscapes. If we can meet these basic requirements, they will be satisfied with our work and refer us to their colleagues and friends. We also adopt a system that will ensure the quality of all the materials we use. For example, the plantings that we install in your landscape are all handpicked by our plant experts. They are grown in our own nursery, so you are assured of their health and proper handling. 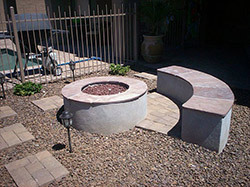 Meanwhile, the landscape products that we use are sourced from reputable suppliers and manufacturers. Our irrigation system, for example, is supplied to us by Hunter, the leading irrigation manufacturer in the country. Most residents in the Peoria area have already tried and tested our kind of service. They are more than happy with the results of our work because of our meticulous and systematic handling of their landscaping projects. 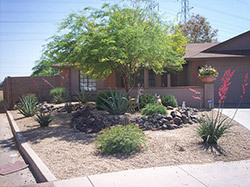 With us, they also have a landscaper who can provide all the services they need. From the different types of plantings to irrigation products and pavers, we have them in our nursery and showroom. If you also want to hire a reliable landscape installation company, don't think twice about hiring us. Rest assured that we will do our best to realize your dream landscape at cost that won't ruin your pockets. We also have expert crews who can guarantee outstanding installation of various landscape features and amenities. Call us at (623) 398-6319 for your inquiries.